This image shows the moon as its shadow wanes, leading up to a new moon. Next Thursday (May 25) brings us the moon that will come closest to the Earth in 2017. This information may bring to mind the term "supermoon," branding invented some years ago by an astrologer. When the moon arrives at that point in its orbit closest to the Earth (known as perigee) and also is at or near the full phase, the media immediately hypes it as a "special event" and urges the public to head outside to gaze upon a moon that will appear 14 percent larger and 30 percent brighter than normal. Still, armed with that knowledge, those same casual observers suddenly look upon the moon in a completely new light (no pun intended). I also can visualize parents taking their child outside and pointing out that what they were now seeing was the biggest and brightest of all full moons — a supermoon! To which the child responds: "It doesn't look very different to me." This is a sort of celestial version of the Hans Christian Andersen tale "The Emperor's New Clothes." Anyway, if you're already making plans to get out and enjoy the 2017 supermoon next week, you're going to be disappointed. Because this time, the closest perigee of the year is going to coincide not with a full moon, but a new moon. So Earth's nearest neighbor will be effectively out of sight to one and all because of its closeness to the sun in the sky. We call such a moon "new" because its position in the sky marks the beginning of a new lunar cycle, or "lunation." An average lunar month (from new moon to new moon) lasts 29.530575 days. We must say "average" because the moon moves around the Earth in an elliptical orbit. When nearest to Earth, it's moving faster; when the moon is at the far point of its orbit (called apogee), it's moving more slowly. When a lunation begins with a new moon at perigee, the elapsed time until the start of the next lunation will be less than the average because of the moon's faster speed. Indeed, the June new moon will come 29.282 days after May's new moon — nearly 6 hours earlier than average. On Thursday, the moon will arrive at its new phase at 3:44 p.m. EDT. The moon will arrive at perigee a little over 5 hours later, at 9 p.m. EDT. The Earth-moon distance often quoted is based on the center of the Earth relative to the center of the moon; for this perigee, that distance will be 221,958 miles (357,207 kilometers). Since the new moon closely aligns with perigee, the range of tides over the upcoming Memorial Day weekend will be abnormally large. Ocean high tides will run noticeably higher than normal, while low tides will be noticeably lower than normal. These are called spring tides, but this is not to be confused with the spring season; rather, the term references how, at high tide, water levels seem to "spring up." So even with the moon out of view, people near the ocean will be able to tell that the moon is closer than normal because of the abnormally high and low tides. On Friday (May 26) and especially Saturday and Sunday (May 27 and May 28), you'll be able to make a nice moon sighting: Earth's nearest neighbor will move out of the sun's glare and into the twilight evening sky, appearing as a lovely crescent sliver in the west-northwest shortly after sunset. A Friday sighting will be particularly impressive if you live in the eastern U.S., because the moon will be just over 28 hours past new phase and will appear exceptionally thin — a hairline or a filament of light, a mere 2.2 percent illuminated by the sun. 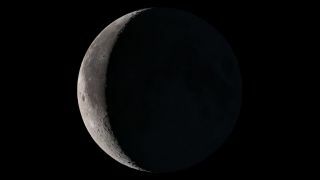 Many observers look upon the first appearance of the evening crescent moon as the "new" moon, but in the official sense that is not true, since the new moon occurs only when it is most closely aligned with the sun in the sky. That will occur on Thursday. Wondering when the full moon will next coincide with perigee? It's a date that will be easy to remember: New Year's Day (Jan. 1), 2018. And yet the moon will be less than 400 miles (643 km) closer on that day than it will be on Thursday. Editor's note: If you have an amazing photo of the moon or any other night sky sight that you'd like to share with us and our news partners for a possible story or image gallery, please contact managing editor Tariq Malik at spacephotos@space.com. Joe Rao serves as an instructor and guest lecturer at New York's Hayden Planetarium. He writes about astronomy for Natural History magazine, the Farmers' Almanac and other publications, and he is also an on-camera meteorologist for Fios1 News in Rye Brook, NY. Follow us @Spacedotcom, Facebook or Google+. Originally published on Space.com.